I will be honest, it has been a long time since I have been excited about gold, but I am starting to like gold once again. I had grown too bored to care what gold did. With the bull market top in 2011, and four years later price continues to founder can you blame me? Let me start out by painting a picture for you. 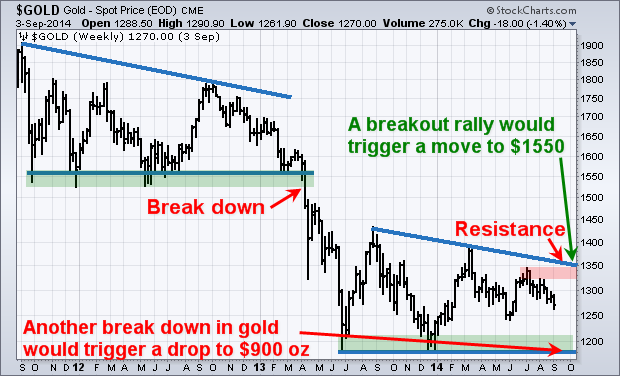 This is my technical analysis overlaid on the price of gold. This simply gives you a visual of were the price of gold is trading. GOLD HOLDS LONG-TERM BEARISH PATTERN Gold peaked around 1900 in September 2011 and quickly fell to the 1550 area. The metal then consolidated for 18 months before it broke support. The sharp decline triggered a drop in price to $1200 in April 2013. Since then gold has been in another consolidation, which is a bearish continuation pattern.